Medama-Oyaji (目玉のおやじ) comes from the manga/anime/game/movie "GeGeGe no Kitaro" created by Shigeru Mizuki. In the show, Medama-Oyaji is Kitaro's father. In fact, the literal translation of Medama-Oyaji is "Eyeball Father"
He's a Yokai of course, and while small in size he is strong in spirit. He acts as Kitaro's guide through the spirit world and in dealings with other Yokai. You can see the size comparison to Kitaro in the picture below. Revoltech Medama-Oyaji is available at HobbyLink Japan. 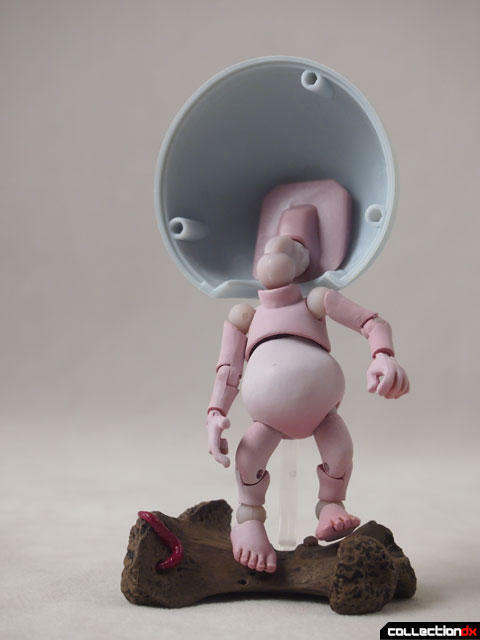 This toy is another release in the Takeya sub-line of Revoltech figures by Kaiyodo of Japan. It's named as such because all the figures in this line are sculpted by the legendary Takeyuki Takeya. 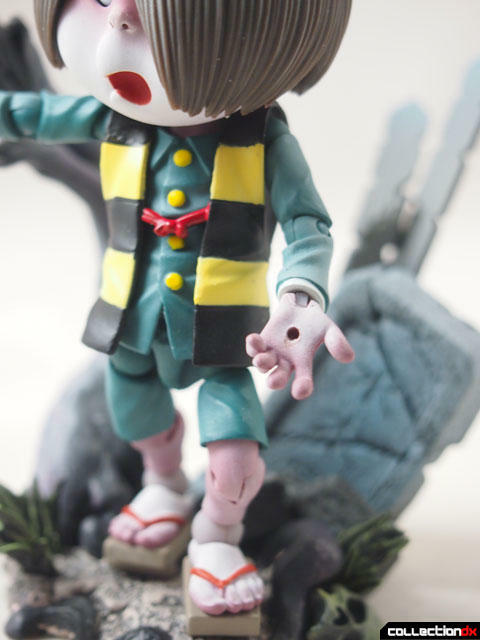 Medama-Oyaji is one of three characters released from GeGeGe no Kitaro in the line. 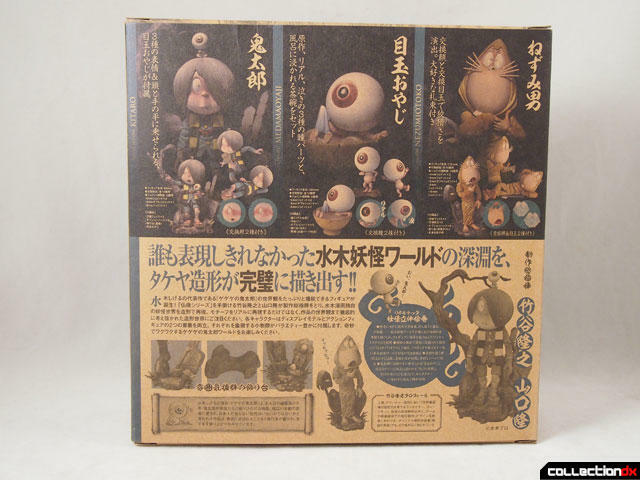 The box is the same as the other releases from GeGeGe no Kitaro aside from the sticker on the front and some assembly instructions on the tabs. The large window box gives you a good view of the weirdness that you are getting yourself into. Inside you get a bunch of parts that look interesting, and a stand. For some reason these toys don't come with the usual revoltech paperwork (catalogs, reply cards, etc.). Medama-Oyaji is certainly odd looking. 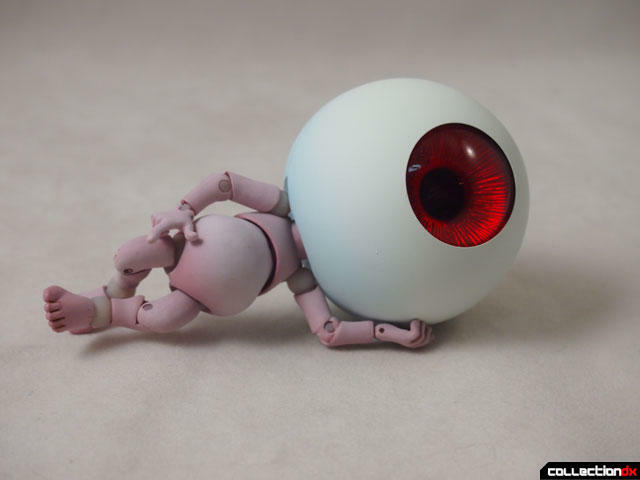 A large eyeball perched atop a naked midget body is not something you see everyday. 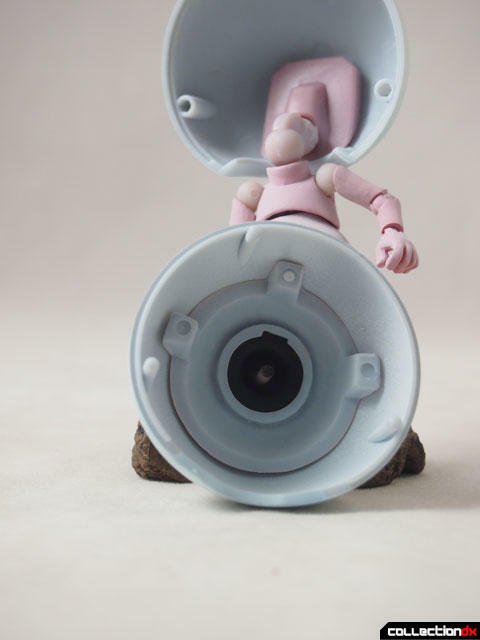 Despite the size of the head, you can in fact get it standing without a stand. 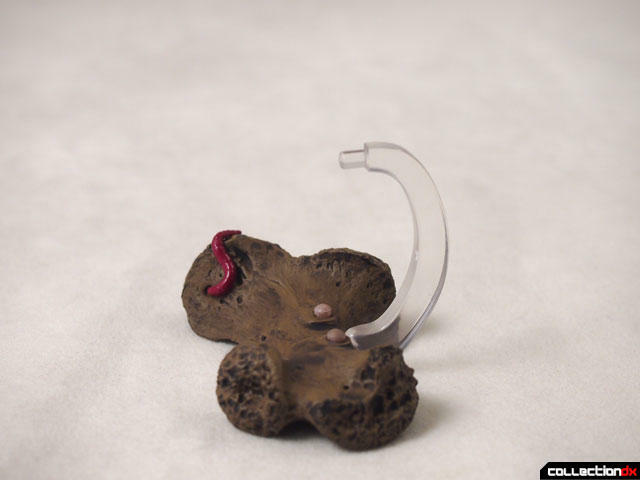 The stand is a piece of bone with a clear stand connector that snaps in back. 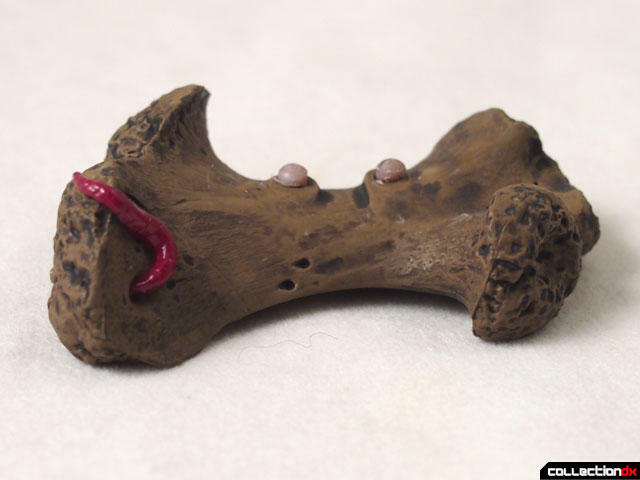 Although the bone has two nubs for the feet it is best just to use the clear stand that goes in the back. The nubs are too tight of a fit and difficult to get in. You may have noticed the multitude of eyes that it comes with. 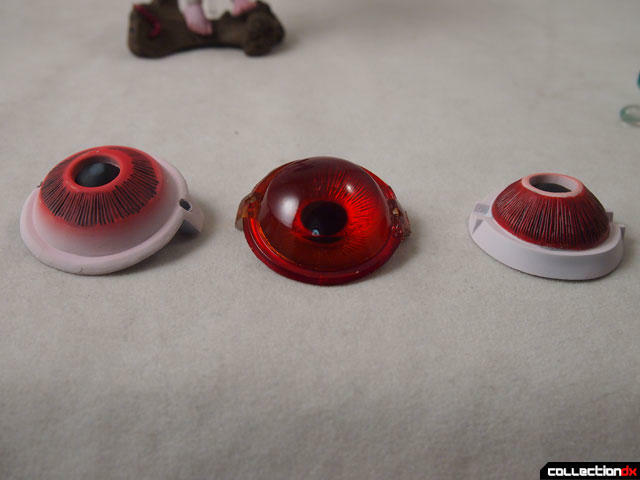 These are easily swappable by splitting the ey in half and removing the iris. 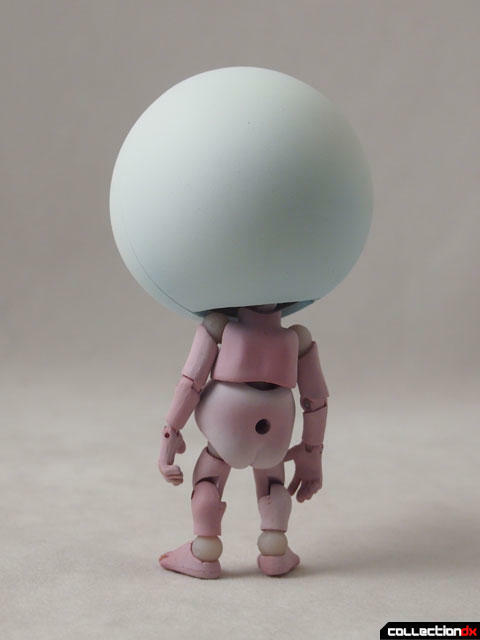 The default eye is the "manga" style eye, and goes well with the theme of the figure. If you want a more realistic look you can swap it out with the realistic clear iris. This has some good depth and a nice effect. The third eye has got this dripping effect which is either a tear or a bead of sweat - I can't be sure. It's a cool effect nonetheless. 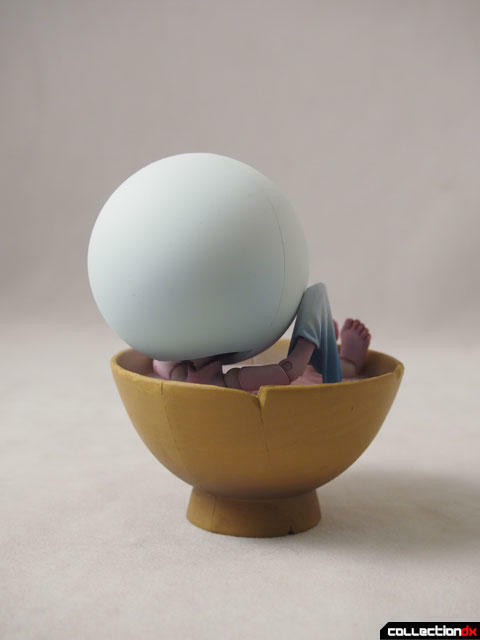 Medama-Oyaji likes to bathe, so included with this set is his teacup which doubles as a bathtub. 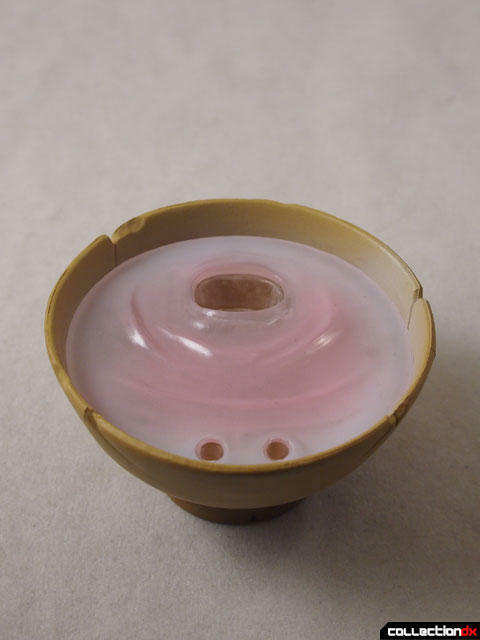 The inside of the tub is a milky clear piece of PVC with holes in it for revoltech joints. To attach Medama-Oyaji, you need to separate the upper chest and the feet. The chest joint goes in the large hole and the feet plug into the two small holes. He also comes with his washcloth accessory that takes the place of a hand. This was a fun set for a neat character. I didn't find the Revoltech aspect annoying at all and thought it worked well. It's well sculpted with great paint applications and nothing seemed fiddly or fragile. You can get your very own Medama-Oyaji at HobbyLink Japan!